Lord Always wants us to participate in human suffering. At the end of Lent, I was pondering that it is so vital to know how to live the terrible minutes, the anguish, being thrown away, depression, minutes of disappointment, frustration, and unfaithfulness – minutes that are a piece of the human presence in light of the fact that they are a piece of the human reality. Some of the time the Lord needs us to partake in human enduring. We must develop in this ability to endure and in the meantime offer it to Jesus. To do this, it is important to identify with Him, to yell out to God about our affliction, bowing with our eyes settled on the cross. We must structure along these lines of thinking so that, in the minute of the Cross, we don't stroll around whining, attempting to escape it, and squandering this valuable minute in which Jesus is offering the Cross to us and providing for us a little a piece of His agony on the Cross. Agony is a piece of human life. Don't evade it, minimize its criticalness, or discuss it in such an inconsequential way. This is my experience as a powerless and delicate lady. I realize that commonly I, as well, lost those minutes. When I pondered my life and truly perceived how frequently this happened, I said to myself, "Take a gander at what I lost. How adolescent I was!" We have a three-saying outflow in Community to help us traverse the minutes of misery and incitement: "be noiseless, swallow, and endure." When somebody condemns or censures you, and you react by safeguarding yourself, the other youthful men in Community say, "You've missed the vessel!" What we mean is that you've missed the "vessel" of development, of poise, of the ability to be calm and to endure with nobility in hush. I educate these things to the youngsters in light of the fact that, when they leave the Community, their supervisor at work will need to be correct, their companion will need to be correct, their kids will contend, and – without an uncertainty – somebody must give in so peace can rule. Yes, peace is most vital and to know how to "give in" is our quality and protection. It is the perplexing school of the Cross, of our God who did not clarify the Cross yet invited it, encountering the Cross in the assemblage of His crucified Son. Jesus welcomes us to take a gander at Him, to approach Him for confidence and love, so that our heart won't lose trust, and after the dimness of Good Friday, we will know how to catch in our lives the brilliant light of Easter morning! The climbed Jesus is our actual trust, in light of the fact that in Him ache and demise are vanquish. The Sea of Galilee Boat also known as the "Jesus Boat" was an ancient fishing boat from the 1st century CE (the time of Jesus Christ), discovered in 1986 on the north-west shore of the Sea of Galilee in Israel. The remains of the boat, 27 feet (8.27 meters) long, 7.5 feet (2.3 meters) wide and with a maximum preserved height of 4.3 feet (1.3 meters), first appeared during a drought, when the waters of the Sea (actually a great fresh-water lake) receded. There is no evidence connecting the boat to Jesus or his disciples. The remains of the boat were found by brothers Moshe and Yuval Lufan, fishermen from Kibbutz Ginnosar. The brothers were keen amateur archaeologists with an interest in discovering artifacts from Palestine's past. It had always been their hope to one day discover a boat in the Sea of Galilee, where they and generations of their family had fished. When drought reduced the water-level of the lake, the two brothers examined the newly exposed beach and stumbled across the remains of the boat buried in the shore. The brothers reported their discovery to the authorities who sent out a team of archaeologists to investigate. Realising that the remains of the boat were of tremendous historical importance to Jews and Christians alike, a secret archaeological dig followed, undertaken by members of Kibbutz Ginosar, the Israel Antiquities Authority, and numerous volunteers. Rumour spread that the boat was full of gold and the dig had to be guarded night and day. Excavating the boat from the mud without damaging it, quickly enough to extract it before the water rose again, was a difficult process which lasted 12 days and nights. The boat was then submerged in a chemical bath for 7 years before it could be displayed at the Yigal Allon Museum in Kibbutz Ginosar. "Man's extremity is God's opportunity." This is a very familiar saying. prove that ability when the storm is actually raging around us. upon, cling to, and draw upon, at all times and under all circumstances. dishonour the Lord in our ways. the sea, Peace, be still. And the wind ceased, and there was a great calm. ship full of water -- the Master asleep. This was a trying moment indeed. the Son of God on board? Yet this was what they feared. It can be said that they did not think of the Son of God at that moment. always reasons. It looks only at the circumstances and leaves God out. Faith, on the other hand, looks only at God and leaves the circumstances out. them (1 Kings 17:14-16). Such is faith. wind to treat Him as unceremoniously as though He were an ordinary man. we can only stop and worship. However, as we have said, unbelief roused the Blessed Lord out of His sleep. themselves to say, "Don't you care?" Yet, dear friends, is this story not a mirror in which we see ourselves reflected? and our need is not supplied. terrible question: "Don't you care?" The thought of this is deeply humbling. suspicion should fill us with the deepest remorse and sorrow. trial is an imperishable reality, but gold will eventually fade away. furnace and caringly watches over it. to forget 10,000 mercies in the face of a single difficulty. heaven in a chariot of fire. patient grace and uncondemning love? He rises and with His almighty voice hushes the storm and calms the sea. ready to meet His people's need, to quiet their anxieties and remove their fears. by not leaning more on the arm of Jesus day by day. We are so easily terrified. Every breath of wind, every wave, every cloud agitates and depresses us. has numbered the very hairs of our head. He could easily say to us as He said to His disciples, "Why are ye so fearful? for our souls as we pass across life's stormy sea homeward to our eternal rest. Christ is in the boat! Let that always be enough. Let us calmly rely on Him. must be Christ Himself who is laid hold of and enjoyed in the heart by faith. Then all will be to His glory and our abiding peace and joy! manner of man is this, that even the wind and the sea obey him?" (4:41). 1-3 Back in the boat, Jesus and the disciples recrossed the sea to Jesus' hometown. They were hardly out of the boat when some men carried a paraplegic on a stretcher and set him down in front of them. Jesus, impressed by their bold belief, said to the paraplegic, "Cheer up, son. I forgive your sins." Some religion scholars whispered, "Why, that's blasphemy!" 4-8Jesus knew what they were thinking, and said, "Why this gossipy whispering? Which do you think is simpler: to say, 'I forgive your sins,' or, 'Get up and walk'? Well, just so it's clear that I'm the Son of Man and authorized to do either, or both. . . ." At this he turned to the paraplegic and said, "Get up. Take your bed and go home." And the man did it. The crowd was awestruck, amazed and pleased that God had authorized Jesus to work among them this way. 9Passing along, Jesus saw a man at his work collecting taxes. His name was Matthew. Jesus said, "Come along with me." Matthew stood up and followed him. 10-11Later when Jesus was eating supper at Matthew's house with his close followers, a lot of disreputable characters came and joined them. When the Pharisees saw him keeping this kind of company, they had a fit, and lit into Jesus' followers. "What kind of example is this from your Teacher, acting cozy with crooks and riffraff?" 12-13Jesus, overhearing, shot back, "Who needs a doctor: the healthy or the sick? Go figure out what this Scripture means: 'I'm after mercy, not religion.' I'm here to invite outsiders, not coddle insiders." 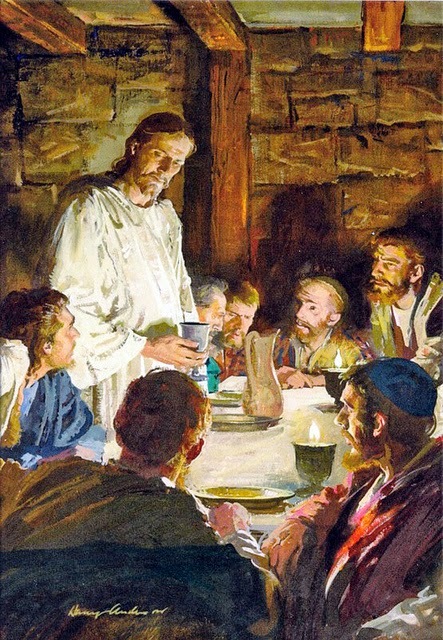 14A little later John's followers approached, asking, "Why is it that we and the Pharisees rigorously discipline body and spirit by fasting, but your followers don't?" 15Jesus told them, "When you're celebrating a wedding, you don't skimp on the cake and wine. You feast. Later you may need to pull in your belt, but not now. No one throws cold water on a friendly bonfire. This is Kingdom Come!" 16-17He went on, "No one cuts up a fine silk scarf to patch old work clothes; you want fabrics that match. And you don't put your wine in cracked bottles." 18-19As he finished saying this, a local official appeared, bowed politely, and said, "My daughter has just now died. If you come and touch her, she will live." Jesus got up and went with him, his disciples following along. 20-22Just then a woman who had hemorrhaged for twelve years slipped in from behind and lightly touched his robe. She was thinking to herself, "If I can just put a finger on his robe, I'll get well." Jesus turned—caught her at it. Then he reassured her: "Courage, daughter. You took a risk of faith, and now you're well." The woman was well from then on. 23-26By now they had arrived at the house of the town official, and pushed their way through the gossips looking for a story and the neighbors bringing in casseroles. Jesus was abrupt: "Clear out! This girl isn't dead. She's sleeping." They told him he didn't know what he was talking about. But when Jesus had gotten rid of the crowd, he went in, took the girl's hand, and pulled her to her feet—alive. The news was soon out, and traveled throughout the region. 27-28As Jesus left the house, he was followed by two blind men crying out, "Mercy, Son of David! Mercy on us!" When Jesus got home, the blind men went in with him. Jesus said to them, "Do you really believe I can do this?" They said, "Why, yes, Master!" 29-31He touched their eyes and said, "Become what you believe." It happened. They saw. Then Jesus became very stern. "Don't let a soul know how this happened." But they were hardly out the door before they started blabbing it to everyone they met. 32-33Right after that, as the blind men were leaving, a man who had been struck speechless by an evil spirit was brought to Jesus. As soon as Jesus threw the evil tormenting spirit out, the man talked away just as if he'd been talking all his life. The people were up on their feet applauding: "There's never been anything like this in Israel!" 34The Pharisees were left sputtering, "Hocus-pocus. It's nothing but hocus-pocus. He's probably made a pact with the Devil." 35-38Then Jesus made a circuit of all the towns and villages. He taught in their meeting places, reported kingdom news, and healed their diseased bodies, healed their bruised and hurt lives. When he looked out over the crowds, his heart broke. So confused and aimless they were, like sheep with no shepherd. "What a huge harvest!" he said to his disciples. "How few workers! On your knees and pray for harvest hands!" “Man's extremity is God's opportunity.” This is a very familiar saying. is one thing to speak out a truth and another thing to realize the power of that truth. It is one thing, when sailing over a calm sea, to speak of God's ability to keep us during the storm, and it is another thing altogether to prove that ability when the storm is actually raging around us. Yet God is ever the same. In the storm and in the calm, in sickness and in health, in pressure and in ease, in poverty and in abundance, He is "the same yesterday, today, and forever" -- the same grand reality for faith to lean upon, cling to, and draw upon, at all times and under all circumstances. But we are unbelieving! Here lies the source of weakness and failure. We are perplexed and agitated when we ought to be calm and confiding. We are looking about when we ought to be counting on God. We are calling for help when we ought to be looking to Jesus. Because of this we fail greatly and dishonour the Lord in our ways. beat into the ship, so that it was now full. And he was in the hinder part of the ship, asleep on a pillow: and they awake him, and say unto him, Master, carest thou not that we perish? And he arose, and rebuked the wind, and said unto the sea, Peace, be still. And the wind ceased, and there was a great calm. we had been there. Still, it is obvious to us where they failed, so we must learn from their experience. There is nothing more absurd and irrational than unbelief when we come to look at it calmly. In the scene before us, this absurdity is very apparent. What could be more absurd than to think that the boat could possibly sink with the Son of God on board? Yet this was what they feared. It can be said that they did not think of the Son of God at that moment. They thought of the storm, the waves, the rising water, and judging according to nature, it seemed a hopeless case. This is how the unbelieving heart always reasons. It looks only at the circumstances and leaves God out. Faith, on the other hand, looks only at God and leaves the circumstances out. If the disciples had possessed this faith, they would have been able to sleep beside their Master in the midst of the storm. However, unbelief made them uneasy; they could not rest themselves, and they actually stirred the blessed Lord out of His sleep by their unbelieving fears. Jesus was weary from the constant labour. He knew what fatigue was; He had come down into all our circumstances. However, as we have said, unbelief roused the Blessed Lord out of His sleep. The disciples woke Him and said to Him, "Teacher, don't you care if we drown?" (4:38). What a question! "Don't you care?" How it must have wounded the sensitive heart of the Lord! How could they ever think that He was indifferent to their trouble and danger? How completely must they have lost sight of His love -- to say nothing of His power -- when they could bring themselves to say, "Don't you care?" In a word, we are passing through deep waters in some way or another. The storm rages; wave after wave rolls over our tiny boat. We are brought to our extremity; we come to our wits' end, and our hearts often feel ready to ask the terrible question: “Don't you care?” The thought of this is deeply humbling. To think of our grieving the loving heart of Jesus by our unbelief and suspicion should fill us with the deepest remorse and sorrow. But consider the absurdity of unbelief! How can that One who gave His life for us -- who left His glory and came down to this world of strife and misery and died a shameful death to deliver us from eternal wrath -- how can such a One ever fail to care for us? Yet we are ready to doubt, or we grow impatient under the trial of our faith. We quickly forget that the very trial from which we hide and under which we struggle is far more precious than gold. The result of our trial is an imperishable reality, but gold will eventually fade away. The more that genuine faith is tried, the brighter it will shine. Therefore, the trial, however severe, is sure to result in praise and honour and glory to Him who not only supplies the faith but also takes that faith through the furnace and caringly watches over it. But the poor disciples failed in their moment of trial. Their confidence gave way; they stirred their Master from His sleep with that most unworthy question: "Don't you care if we drown?" What creatures we are! We are ready to forget 10,000 mercies in the face of a single difficulty. David could say, "I will one day die at the hand of Saul." And how did it turn out? Saul fell on Mount Gilboa, and David was established on the throne of Israel. Elijah ran for his life when Jezebel threatened him, but what was the result? Jezebel was dashed to pieces on the pavement, and Elijah was taken to heaven in a chariot of fire. In the same way, the disciples thought they were going to be lost -- with the Son of God on board. But what was the result? The storm was hushed into silence, and the sea became like glass when it was spoken to by that Voice which called the world into existence. "He got up, rebuked the wind and said to the waves, "Peace, Be still!' Then the wind died down and it was completely calm (4:39). What a combination of grace and majesty is here! Instead of rebuking the disciples for interrupting His sleep, He rebukes the elements that had frightened them. This was the way He replied to their question, "Don't you care?" Blessed Master! Who would not trust You? Who would not adore You for Your patient grace and uncondemning love? There is something perfectly beautiful in the way in which our blessed Lord rises, without an effort, from the rest of perfect humanity into the activity of essential deity. As man, weary from His work, He slept on a cushion; as God, He rises and with His almighty voice hushes the storm and calms the sea. Such was Jesus -- very God and very man -- and such He is now. He is always ready to meet His people's need, to quiet their anxieties and remove their fears. Oh that we trusted Him more simply! We have no idea of how much we lose by not leaning more on the arm of Jesus day by day. We are so easily terrified. Every breath of wind, every wave, every cloud agitates and depresses us. Instead of calmly lying down and resting beside our Lord, we are full of terror and perplexity. Instead of using the storm as an occasion for trusting Him, we make it an occasion for doubting Him. No sooner does some minor problem arise than we think we are going to perish, even though He assures us that He has numbered the very hairs of our head. He could easily say to us as He said to His disciples, "Why are ye so fearful? how is it that ye have no faith?" (4:40). It would indeed seem at times as though we had no faith. But oh, His tender love! He is ever near to shield and to shelter us, even though our unbelieving hearts are so ready to doubt His Word. He does not deal with us according to our poor thoughts of Him but according to His own perfect love toward us. This is the solace and rest for our souls as we pass across life's stormy sea homeward to our eternal rest. May the Holy Spirit teach us to make a fuller, freer, bolder use of Christ! It must be Christ Himself who is laid hold of and enjoyed in the heart by faith. Then all will be to His glory and our abiding peace and joy! In conclusion, we should notice how the disciples were affected by the scene before us. Instead of the calm worship of those whose faith had been answered, they manifested the amazement of those whose fears had been rebuked. "And they feared exceedingly, and said one to another, What manner of man is this, that even the wind and the sea obey him?" (4:41). Surely they ought to have known Him better. Yes, dear reader, and so should we. The vital thing in discipleship is to actually follow Jesus Christ wherever He goes. Have I left the lesser loyalties to follow the higher priorities of the Kingdom of God? The crowds along the lakeside wanted more healings than teaching. Jesus got into a boat and headed to the other side of the Sea of Galilee. The vital thing Jesus wants is for us to follow Him. Jesus still says to would be disciples, “Follow Me, and let the dead bury the dead” (Matthew 8:22). Jesus got in the boat “and His disciples followed Him” (v. 23). Have we gotten into the boat with Jesus? Weak faith grows strong in the fierce storms of life. One moment Jesus is asleep on a pillow in the rear of the boat in a fierce storm, overcome with exhaustion from a busy day. Then we see Him a few moments later calming the fierce wind and waves, which only God can do. Matthew, Mark and Luke tell the events that day when Jesus and His disciples were crossing the Sea of Galilee (Luke 8:22). Jesus, exhausted from a day of ministry, fell asleep in the rear of the boat. “A fierce gale of wind descended upon the lake, and they began to be swamped and to be in danger” (v. 23). Matthew who was an eyewitness said, “There arose a great storm,” literally “a shaking.” The “boat was covered with waves” (Matt. 8:24). It was such a severe storm that these professional sailors panicked. Jesus was not only divine, but He was thoroughly human. He is the God-man. He is fully God and He is fully man. Here we have a beautiful picture of the human side of Jesus because He was in the need of rest. He was tired and exhausted. He needed to get away from the crowds and rest. He put His trust in His heavenly Father to watch over Him. This storm was different from anything they had ever encountered before. They had never experienced anything like it. Humanly speaking the situation became increasingly grave. The disciples panicked. “Save us, Lord; we are perishing!” (Matt. 8:25). Jesus “rebuked the wind and the surging waves, and they stopped, and it became calm” (LK. 8:24). Matthew says, “it became perfectly calm,” or literally “a great calm occurred.” After such a storm a lake does not calm down that quickly and stay that way. The disciples knew that it normally takes a while for the waves to settle down. Here, eyewitnesses said the lake calmed immediately. Christ, God omnipotent, was in the boat. He is the master of the wind and the waves. Wherever Jesus is the power of God is there. Wherever Jesus is the storm becomes calm. Suddenly the surface of the lake became as smooth as a piece of glass. The reaction of the disciples at the calmness struck them with “fear and amazement.” It is probably correct to say they were now more afraid of the calmness than the storm. Jesus asked, “Where is your faith?” (Lk. 8:25). His faith was in His Father (Ps. 89:8-9). The amazed disciples were saying to one another, “Who then is this, that He commands even the winds and the water, and they obey Him?” (v. 25). Where was their faith? They had enough to get into the boat with Jesus and follow Him. Yes, getting into a fishermen’s boat was their safety zone. They had done that hundreds of times. They had also ridden out a few bad storms in their lifetime. Why were they not exercising their faith in Him at this time? Our faith in God has to be exercised personally. It refuses to be controlled by the fierce storms in life. It refuses to panic when the going gets tough and beyond our comfort. We have to focus our faith on Him. The thing that moved Jesus in this account was not the violent storm, but the lack of faith of the disciples. “Why are you timid, you men of little faith?” (Matt. 8:26). With Jesus in our boat we should have courage to face the storms by faith in Him. Christ is always in the boat. Jesus is praying that we will have strong faith in Him (Lk. 22:31-32). The things that hinder our faith are doubt, rationalizations, anxiety, lack of courage, etc. Faith is volitional. It is a choice I make. Our faith has to be tested before it can be trusted. God allowed a violent storm to test the disciples. Jesus entrusted His safety to the Father. The disciples trusted in their own competence as professional fishermen. “Their unbelief was more dangerous than the storm.” It takes God to change the weather. “Behold God is my salvation, I will trust and not be afraid” (Isaiah 12:2). Where is your child like trust? Would the One who had chosen them to follow Him allow them to perish in the storm? Was not His presence reassuring? We know Jesus had the storm “under control” because He was sound asleep in the raging storm.